BEIJING -- China's Shenyang Brilliance Jinbei Automotive will build a new small car plant, say company sources. The plant will build cars for domestic and overseas markets, says the Brilliance spokeswoman. The new plant, with annual capacity of 150,000 small cars, will be completed and put into production in June 2010. Total investment will be 3 billion yuan ($438 million). 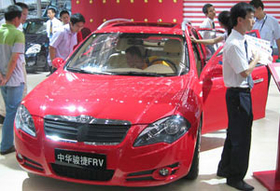 Brilliance now builds the FRV hatchback, the Brilliance BS6 and BS4 sedans, as well as a coupe and a wagon in the existing plant in the northeast China city of Shenyang. It also plans to build a three-box sedan using the FRV's platform in the same plant in 2009, says a Brilliance spokeswoman. After the new plant becomes operational, the production line for the Brilliance FRV and its sedan version will be moved to the new plant, she adds. A crossover based on the same platform will be added later, says a company source. With its chassis benchmarked against the Volkswagen Bora, the small car platform of the FRV was designed by Brilliance's own r&d team, says a Brilliance executive. Brilliance makes cars under its Brilliance brand. It also produces vans, minibuses and light trucks under the Jinbei brand. The company sold 285,119 units in 2008. Brilliance's 2009 sales target is 330,000 units, including both commercial and passenger vehicles, He Guohua, vice chairman of the company, told Automotive News in a recent interview during the Detroit auto show. Brilliance also produces the BMW 3- and 5-series sedans in a joint venture with the BMW Group in Shenyang.